It is Sunday morning, October 20, 2013 and Jean and I have just had the opportunity to reunite with our fond friends at Church. I mention this so as not to keep anyone hanging – yes, we did make it home to Cary, NC from Denver, CO in six and one half relatively smooth sailing days. 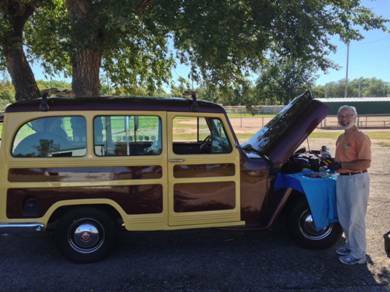 The Jeep repair shop had completed the head gasket and head reconditioning work in Denver Wednesday afternoon, October 9th, but we felt it would be best to use the balance of that day to wrap up some office work and get a fresh start for home Thursday morning. This also gave me an opportunity to drive the Jeep locally to make sure no additional gremlins remained from our arduous trek to the 12 National Parks. I was confident that the fellow who did the engine repair work had done all possible to assure us safe and reliable transportation home (he had even gone around the engine to check fuel, water, and vacuum fittings for leaks, and took it out for a long test drive after the repairs). However, there could have been some issues that were unseen and/or unforeseeable resulting from the Jeep’s recent experiences. Jenny ran as well as ever. We left Highlands Ranch, CO on the southeast side of Denver mid-morning of Thursday, October 10th. We had selected Scott City in west central Kansas as our day’s stopping point primarily as it was on a different route from our trip out and would be as far as we felt we could travel before dark. (It is a whole different world if one has car problems once the sun sets.) It was not long after we started our southeastward journey from Denver that we began to encounter fierce winds from the south. In a “normal” vehicle, this might be just a small annoyance; but to us this was a significant challenge. The strong winds, which we had learned of on the Weather Channel before we left Denver, represented a significant challenge to our ability to maintain highway speed and direction. Nonetheless, we wrestled with the situation southeast to Eads, CO where we began our 150 mile due east shot out of Colorado and across Kansas to Scott City. Heading east with 30 to 40 mph winds coming out of the south meant a constant right-hand tug on the steering wheel to maintain a straight line course. It was unseasonably warm, so we had to crack the door windows (our air conditioning) which resulted in a constant din of noise as the buffeting wind passed through the interior of the Jeep. We were determined to make our evening’s destination and plodded on. One entertaining feature was the presence of tumbleweeds crossing our path as we made our way down the road. The bush “creatures”, measuring from 1 foot to 3 feet in diameter, were lifelike in their behavior. A number of them would collect in the ever-present gully on the windward side of the road; and then, as if on cue, would collectively scamper across the road in defiance of on-coming traffic. They played this game of chicken with us through the greater part of western Colorado, at times ending up directly in the path of oncoming vehicles, including ours where they would either bounce over the top or get collected by the offender. One could imagine that the idea for the Star Trek episode “The Trouble with Tribbles” came directly out of someone’s similar tumbleweed experience. We got a chuckle during a mandatory fuel/potty stop in western Kansas to find tumbleweeds lodged in our grill, under the car and in the wrap-arounds of our rear bumpers. 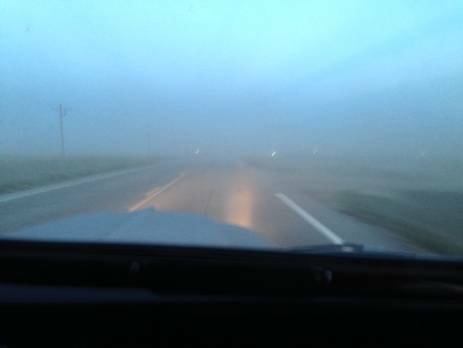 Back to October 10th and the beginning of the trek home – another byproduct of the incessant southerly wind was the dust that it kicked up from the semi-arid plains that we were crossing in western Kansas. At one point, perhaps owing to a lack of vegetation on an upwind plot of ground, we encountered a stream of dust crossing our path for a couple hundred yards that was so thick that we had to slow to a crawl with headlights on lest we run into some similarly blinded critter or vehicle stalled on the road ahead of us. 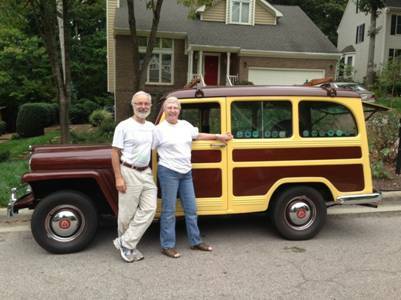 The dust was so fine that it did no damage to the exterior of our Jeep; however, a coating of it still remains to be removed from the Jeeps’ interior and engine compartment. We arrived in Scott City, Kansas just before sundown having survived on peanut M&Ms on the go for lunch in order to make up for the wind-caused delays. We had been running east just ahead of what was predicted to be a severe thunderstorm at our backs. We quickly got settled in our motel room and ran out for a fast-food meal in order to get back and honker down for the impending storm. The motel proprietor was kind enough to let us park the Jeep under their front canopy for the evening as protection from potential hail accompanying the predicted storm. Fortunately, the storm was far less severe than predicted and all was well the next morning. As with the previous day, the selection of the evening stop for October 11th was primarily determined by the distance that we predicted we could reasonably cover that day. The previous day’s battle with wind and dust had worn us down a bit, so we did not try to be too aggressive in our travel plans. Kansas route 96 and its eastward extensions provided an essentially straight due east shot from Scott City to Emporia, KS with primarily cross-roads sized towns inter-dispersed along the route to interrupt our mind-blowing 55mph pace. 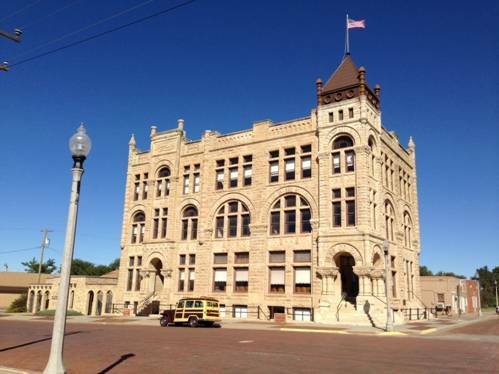 In Ness City, KS we spotted the impressive Ness County Bank building constructed in the late 1880s. With its finely carved limestone exterior, it is purported to be the “most imposing structure in Kansas west of Topeka. It is currently home to the Ness County Chamber of Commerce and the Prairie Mercantile. Later we stopped for one of our traditional peanut butter and honey picnic luncheons in a municipal park in Great Bend, KS situated along our straight-line route to Emporia and night’s lodging. Despite a very tempting and gracious invitation from my cousin Walter and his wife Judy to spend an evening at their home southwest of St Lewis in Washington, MO, we decided that it would be best to stay on our southern route across the of Missouri. 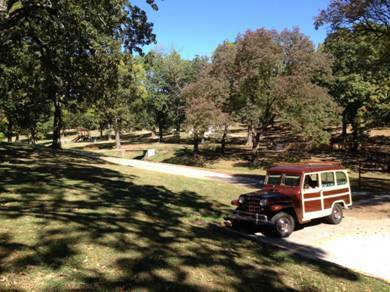 Besides, this route we selected took us through the Ozarks where Walter and Judy have a farmstead that they use for family get-togethers and weekend retreats. We had never traveled through that part of the state. So, on October 12th we headed south a bit from Emporia, KS and then east toward our next evening’s lodging in Willow Springs in the Ozark Plateau region of southeastern Missouri. On the way we stopped for our picnic lunch in Nevada Missouri just east of the Kansas/Missouri border (if Jean was getting tired of peanut butter and honey sandwiches – she never let on). Approaching Nevada, Missouri I noticed some erratic movement from the needle in the Jeep’s amperage gauge (battery charging system indicator). A post-lunch inspection of the generator revealed a nearly separated ground wire at the generator terminal. Not a big problem, as I had brought along an assortment of terminal connectors and a crimping tool. We were soon on the road again with a well behaving generator system. At the end of the day we entered the Ozark region of rolling hills covered with a patchwork of small farms and woodlots packed with deciduous trees (very few pines). It was a pleasant drive over well maintained country roads and pleasant scenery to our motel in Willow Springs, MO at which we arrived just before sunset. After a nice meal at the western style restaurant next door we settled in to prepare for the next day’s journey. The biggest challenge for our travels on Sunday, October 13th was to find a place to attend Mass, having arrived in Willow Springs to late to attend their Saturday evening services. It worked out quite well. We knew that we wanted our final destination for the day to be KenLake Lodge on the western shore of Kentucky Lake, near Aurora, Kentucky. We determined that Popular Bluff, MO, about 2 ¼ hours (for us) east of Willow Springs, MO had an 11am Mass scheduled for Sunday. It meant getting on the road about a couple of hours earlier that our usual departure time; but not an impossible achievement. So, we set a goal of getting started by 8:30 am on the 13th and were on the roll by 8:45am – quite decent. We had not fueled up the prior evening, and hoped to stretch our remaining fuel to Poplar Grove. We ended up stopping to fuel along the way when it did not look like we were going to make it comfortably on what we had remaining. Although we have a 15 gallon fuel tank and get around 20 mpg on at 55mph, we seldom let the fuel level fall below a 5 gallon reserve. Just have not established just how much of the fuel tank capacity is actually available to the engine. Despite my best effort to calibrate the fuel gauge during rebuild, the needle remains above the full mark on the fuel gauge for the first half of a tank and then drops precipitously to the empty mark over the next 75 miles. Just watching the needle’s rapid decent was enough to scare us into the next gas station, particularly when we did not know when we might find another one open on a Sunday morning. We arrived at the church in sufficient time for me to study its internal construction – always important, as there have been predictions of catastrophic collapse whenever if and when I ever enter a church. After Mass we had lunch at the city’s finest Mexican restaurant and then headed off once again toward our KenLake Lodge destination. Although we tried to follow a different path on our return route than that which we had take west 7 weeks earlier, the two paths did coincide at the crossing of the Mississippi and Ohio Rivers. There are not too many options for crossing these huge bodies of water; and besides these crossings near Cairo, Illinois, with their tall, narrow bridges are a thrill to travel – if one does not think about it too much. Going east, one first passes from Missouri into Illinois by crossing over the Mississippi River and then within a few moments, passes from Illinois to Kentucky by crossing over the Ohio River – neat stuff. 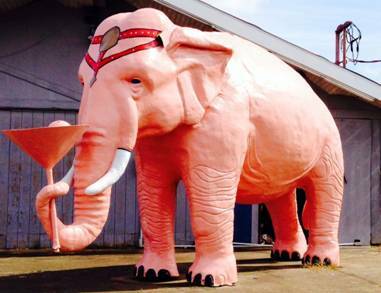 Shortly after fueling up in Mayfield, KY we spotted and photographed a prime example of a Pink Elephant. This has particular significance to Jean and me, having been past recipients of our antique car club’s pink elephant booby prize at our traditional annual Yankee Trader gift swap at which someone takes home a breadbox size pink elephant in lieu of a more attractive gift. Now that would be something to send someone home with! We reached KenLake Lodge near Aurora, Kentucky late in the afternoon of October 13th in time to celebrate my 71st birthday with peanut M&Ms and diet Dr. Pepper (go figure) on a bench overlooking the west branch of picturesque Kentucky Lake in the southwestern corner of Kentucky. We had dinner later that evening at the Lodge and set plans for the next day’s travels. Incidentally, unlike the National Parks, where lodging rates can be extremely high, the nightly rate at the KenLake’s state-run lodge is quite reasonable. On Monday October 14th we set out for Harriman, Tennessee; once more selected for its strategic location at a travel distance that we could reach before nightfall. At this point the destination was along the path that we wished to follow skirting Nashville, TN on the north side and setting us up to skirt Knoxville, TN on the south side the next day. This route took us through settings varying from deeply rural hilly regions to highly trafficked commercial areas. About midway in our day’s journey we spotted the station of an unfamiliar express-lube franchise. I was hoping to give the chassis one last greasing for the trip home and decided to give these folks a shot. As we drove into their lot we were immediately met by an enthusiastic young gentleman who patiently listened to my practiced plea for a well monitored (meaning with my guidance) grease job. His response was an immediate “no problem” which his coworkers affirmed by inviting me down into their clean and orderly pit level to assist with the lube process. Within 10 minutes we had completed task including the greasing of the shifter mechanism under the hood. I gladly rewarded them for their assistance and we were on our way. We reached Harriman, TN, near Oak Ridge, just before sunset and prepared for the next day after dinner at a convenient restaurant. Wanting to take a different path over the Appalachian Mountains than the Cumberland Gap route that we took west, on October 15th,we drove under Knoxville, TN and continued northeast through Tennessee with the seemingly impenetrable Appalachians continuously looming off to our right. Although nowhere on the same scale as the mountains that confronted us on our travels in the West; these large hills nonetheless posed a significant challenge if not traversed in an appropriate location. 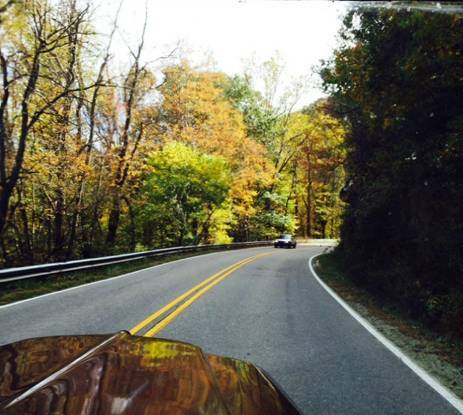 Actually, we really enjoy traveling through the Cumberland Gap and visiting the surrounding historic sites. Like a horse that has sensed the proximity of his home barn, and knowing that North Carolina lay just over the crest of the path we had chosen across the mountains; I incessantly ask Jean if we were in the mountains yet. Finally, just east of Hampton, TN we began to experience winding upward grades indicative of our assent over the Appalachians. I was somewhat familiar with this route, having worked on a mobile home renovation outside of Hampton on a church mission trip some years earlier. However, it was a different experience making the passage as a driver in the Jeep. It did not take us long to crest the mountain and to be greeted by the “Welcome to North Carolina” sign. Although we still had the bulk of the long state of North Carolina to traverse, we were starting to feel the security of having made our way home. We stopped in Boone, NC for a 4pm “lunch” and then proceeded down the mountain to Wilkesboro, NC where we spent the night. We got underway reasonably early (for us) on Wednesday morning October 16th. During our past travels around the state of North Carolina, we had traversed, in sections, the full length of NC 64. 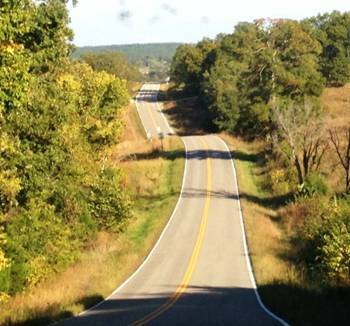 This road takes a sometimes circuitous route from the Outer Banks on the very east end of the state to the Tennessee border on the very west end of the state. We elected to drop down directly south to pick up this familiar route just south of Taylorsville and travel it east the 150 or so miles to a point just 5 miles south of our home in Cary, NC west of Raleigh. On our way south to Taylorsville, I noticed that our amp gauge was indicating a slight battery discharge when it should have been indicating a slight charge (i.e., the generator was not charging the battery. We pulled into a convenience store parking lot to have a look. Sure enough, a second wire had detached itself from its terminal connection at the generator. I had made up a new wiring harness for the Jeep when I first rebuilt it 1977. Over the years a stiffening of the insulation in combination with fatigue of the wire at the crimped terminal junctions had apparently lead to wire separation for the third occasion on this trip. Totally understandable now that I see it, but we had not experienced this on any of the previous 57,000 miles of traveling over the past 36 years. Guess I will have to do some serious rewiring. Anyway, it was another quick fix and we traveled the remainder of our trip home eventless; arriving in Cary, NC mid-afternoon. When we started the Trek 63 days and 10,000 miles earlier, it had been hard for me to imagine what it would be like arriving home at the completion of the journey. Now, even with four days having passed in which to recuperate, I am still having trouble mentally wrapping my mind around all of the events that we experienced during our adventure. If you will give me a few weeks, I promise to organize and compile not only the blog entries that you have so patiently slogged your way through and add some statistical information, but also, better acknowledge our appreciation for the generous contributions time, talent and encouragement by the folks who assisted us along the way. Thank you all for making this a truly outstanding experience for Jean, Jenny and me. Arriving home after our 61 day, 10,300 mile Trek to 12 of the western National Parks – Thank you all!